C/ Corcega 541, 08037 Barcelona, Spain. 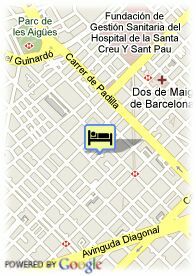 Hotel Sagrada Familia is located in the Eixample quarter in Barcelona. Hotel Sagrada Família with its 84 rooms is a mere 3 minute walk to the most famous monument designed by the legendary architect Gaudí: the Sagrada Familia. This hotel was opened in Autumn 2004 and it has all the comforts of a new construction and the latest design. It is perfect for holidays, business people, and weekend travelers who wish to enjoy the great hospitality of the city. It offers comfort, good service, style and the location you are looking for in the city centre. All rooms are designed with a modern yet comfortable flare in mind. The hotel has convention rooms available for groups ranging from 20 to 100 people. In the common area of the hotel there is an Internet area and a library for the convenience of all our guests. Paid public parking near the hotel (covered) (26.75 €), Reservation obligated. Children less than 1 year(s) old: free of charge. Babybeds: 6.00 € for each additional babybed. 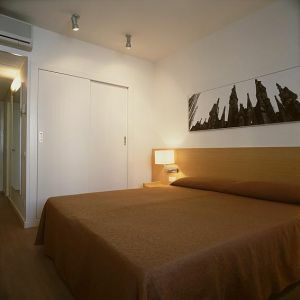 Apartamentos Mur-Mar is located in Les Rambles, 200m from the port, and 700m from Plaza de Catalunya.